It's brand new. It's pink and fluffy. It's our new Poodle Kigurumi Costume! The costume is an all in one pink onesie suit, which fastens at the front with poppers and can be worn over your own clothes. It has a poodle face on the hood, which includes eyes and nose and of course lots of fluffy white sections on top of the hood and around the neckline, giving it a true pampered poodle look. At the back of the outfit is a poodle tail with a pom-pom at the end. There's also some further white details with the cuffs and buttons. 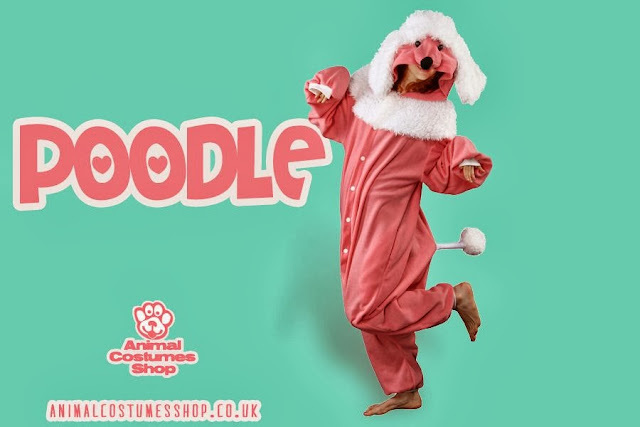 The poodle kigurumi costume will fit adults up to about six foot tall (185cm) and is very wide across the chest so will fit most shapes of people. The main material (the pink onesie) is a soft polyester fleece, so it's really nice and comfy. It would make a fantastic gift for poodle lovers, or a fab poodle costume for an animal themed or 'p' party.